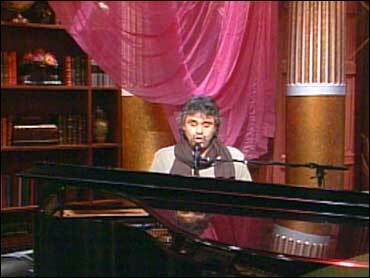 Opera singer Andrea Bocelli has achieved national and international success, topping classical and pop charts. The tenor has sold more than 10 million albums here in the U.S. and more than 40 million worldwide. He's currently on a seven-city North American tour. Before he performed "O Surdato 'Nnammurato" on The Early Show, he told co-anchor Harry Smith that he loves American audiences. "I think in America, there is the most beautiful audience," Bocelli says. "For me, it's a very big emotion to be on stage for them. It doesn't matter what I sing, but the most important thing is to give emotion, to try to give emotion." When he's not working on his music, he's hard at work on his family's 9-acre vineyard. Bocelli was born in 1958 in Lajatico, rural Tuscany. His father, Alessandro, was a wine producer. Now, Bocelli says that he and his brother, Alberto, are trying to continue this tradition. Perhaps one day, he says, Americans will get to enjoy Bocelli wines. "For now, it's too few and it's for my family. Also for a long period during the year, I can't drink, unfortunately," he says. "During the period of the university, it was a good idea for me in order to stop a little bit with the lull and to stay with my friends and to spend some happy hours. It was a good thing." While Bocelli was earning a law degree in Pisa, he used to play in local piano bars classic tunes of such vocal greats as Frank Sinatra, Charles Aznavour and Edith Piaf. His life changed after his childhood idol, Franco Corelli, took him under his wing and his legal career was suspended. Now you can enjoy his music. Note: You can purchase the Bocelli wine directly from the cellar of Alessandro Bocelli Estate, as well as in La Sterza for 20,000 lire. Available vintages are 1998, 1999 and 2000. The vineyard is located in La Sterza, Via Volterrana-Sterza 41 Tuscany, near Volterra.